Ever wondered what it's like to work for a Prime Employer for Women? The team at Tyro shared what it's like to work together, get stuff done and really make a difference. For Tyro employees, the answer to what makes the company special is easy: the people. "You could go to lots of companies and work with smart people," says Dave, an engineer at Tyro. "I think it's the fact that you get to come here you work with a bunch of people who value collaboration, they value teamwork, they value the success of the team over their own individual success." "I love working with intelligent people and people who want to get stuff done," adds CEO Robbie. Another great aspect of Tyro is the company's flat structure and the healthy balance between having autonomy and receiving support. And this support is easy to get: just go up to anyone in Tyro, tap them on the shoulder and they'll stop what they're doing to help. This collaborative culture at Tyro also means employees are helped to develop and thrive in their careers. "The opportunities that working here has given me and the exposure to different areas in the business and the development that I've got from the management here it is really second to none," says Lauren in Sales. This non-hierarchal structure at Tyro also means everyone is treated equally and fairly. 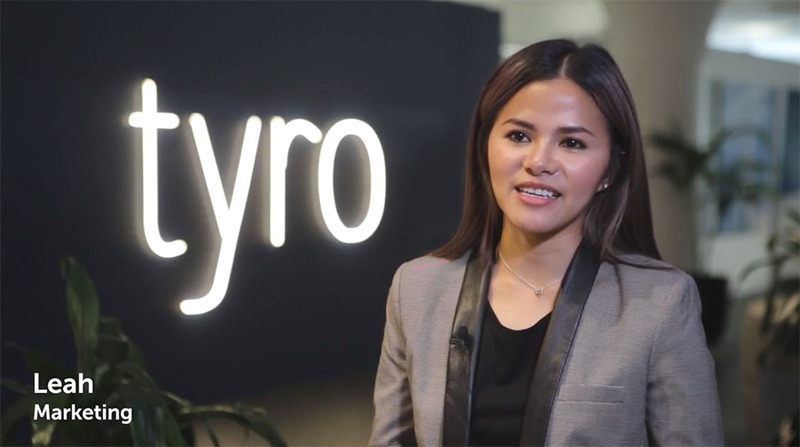 "Tyro is the best place to work because everyone has a voice so it doesn't matter who you are what level you're at, what department you're in, everyone's opinion is valued and listened to. We've got a great bunch of people here," says Lisa in Marketing. Another thing the Tyro team all agree on is that their work at Tyro is helping to make a positive difference to small companies. "It is very rewarding to know that all the different decisions that we make here at Tyro, or the different services and solutions that we provide to our customers, actually make a real difference to our customers," says Bronwyn in Product. The Tyro team all work towards Tyro's mission to help Australian businesses succeed, a worthy cause that creates an energy and vibrancy from everybody wanting to do the best, be the best and produce the best for customers. "The thing that keeps me coming back to work at Tyro every day is that I believe that I am having an impact," says Bridie in Strategy. "I love working at Tyro because I feel we're doing something to many businesses. I actually feel like we're making a difference," explains Account Manager Matt. But what are Tyro looking for in their employees? Tree says she looks for curiosity in applicants. "I want someone who questions and has creative means and approaches to problem solving," explains Tree. "For anybody that's passionate, for anybody that actually likes getting stuff done, for anybody that likes working with really smart people," says Robbie, "Tyro is the place to be." If you're a passionate, curious, and energetic person who feels like they'd fit right into Tyro's company culture, then search and apply for jobs at Tyro today.